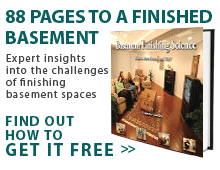 Ohio Basement Systems is a certified Total Basement Finishing dealer. They proudly serve homeowners in Youngstown, Akron, Warren, Cleveland, Sandusky, Canton, Lorain and the surrounding areas. Located in New Philadelphia OH, servicing Tuscarawas, Coshocton, Guernsey counties. Basement Systems of West Virginia is a registered dealer of the Total Basement Finishing network serving homeowners in WV. The materials and products we use are eco-friendly, durable, and promote a safe living environment. Our ThermalDry flooring system and mineral fiber ceiling tiles, for example, will resist mold and mildew growth for at least 30 years, guaranteed! What's more, our eco-friendly SaniDry air system will remove up to 100 pints of water from your basement each day, helping to keep your home comfortable and dry all year long. Some of our basement remodeling systems can even save you money by reducing your energy usage and lowering your electric bill. Installing new basement insulation with the proper R-value, for example, can help seal in your home's warm or conditioned air and reduce your electric bill up to 20%! The job was well done when it was finished. I am very happy with the quality of work. Dan was very knowledgeable. These guys are the best!!! Our experience was very good. The crew was friendly and answered all of our questions. They cleaned up everything and kept equipment stored neatly. I would recommend Ohio Basement Systems to anyone wanting to complete their unfinished basement. Your word of mouth recommendations was what caught our attention. Once you came to our home and sized up what had to be done we were SOLD! The integrity of all concerned was AMAZING. The two young men that came to our home to do the system were just so far above average we were again, AMAZED. Honesty and Integrity are so lacking many times in young people. What an impression these two young men made on us. The clean up ....oh my how relieved I was. The whole experience was quite positive. We are so grateful to all concerned for being so honest with us. THANK YOU ...THANK YOU! If you want to completely remodel your Ohio home’s basement or you’d like to simply refinish it, we’re the company for you! Our trained Ohio basement contractors have years of experience in remodeling, refinishing, and renovating basements. Whether you live in Columbus, Cleveland, Cincinnati, Toledo, or Akron, contact us today to receive your free Ohio basement remodeling inspection and estimate. We guarantee you'll be satisfied with the results! "I am completely satisfied with the work done to my basement." I am completely satisfied with the work done to my basement. "Great Services and attention from Andy and team. They finsihed the work on..."
Great Services and attention from Andy and team. They finsihed the work on time and as expected. They paid attention to details and did a fantastic job listening to our concerns and desires. We are pleased with the end results and we appreciate very much the services provided by Andy and his team. Thanks! "Work was explained clearly and the crew was willing to answer my..."
Work was explained clearly and the crew was willing to answer my questions. By Tim And Amanda S.
"The remodeling crew was prompt,professional, and courteous! We enjoyed the..."
The remodeling crew was prompt,professional, and courteous! We enjoyed the experence and would definatley recomend this company! Andy and Clint were extremely helpful during the entire process. "Did a nice install impressed with the work." Did a nice install impressed with the work. "The project came out as I had planned,even better. My wife and I are very..."
The project came out as I had planned,even better. My wife and I are very pleased. By Kerry And Ricci K.
"5 stars is not enough for Scott, Mike and Andy. They were so nice and..."
"Very Impressed with every person we dealt with from the sales person to..."
Very Impressed with every person we dealt with from the sales person to the contractor Andy. All were excellent! "One word "OUTSTANDING" We could not be happier with the results. Jason..."
One word "OUTSTANDING" We could not be happier with the results. Jason took cafre of all our initial questions and the crew went above and beyond to take care of any concerns we had and always kept us informed step by step during the projuect. I would highly recommend! Customer service and satisfaction is alive and well thanks to Ohio Basement Systems. New home with an unfinished basement. We are looking at some different options and looking for cost effective systems. I want to convert our basement into living area but need it to be dry. Just want priceing for about 1900 sq ft. Finished basement with bar , tv, and home gym in same room. Quote to include full bathroom install, electrical, drop ceiling with removable tiles to get at heating baffles, plumbing. We would like a quote to finish our basement. We would like a full basement quote with a 3 piece bathroom if possible. We have an unfinished basement and would like to get a free estimate on the cost. We are looking to see what it would cost to finish our basement. I had a pipe burst in my basement on 2/1. Everything that was wet/damaged has been removed and the basement was professionally dried out. At this time I need to get estimates for restoring the space. I would like to cover brick walls in my basement to make them look finished. One wall is 12 x 8 feet and the other one 11 x 8 feet. Comment: New home with an unfinished basement. We are looking at some different options and looking for cost effective systems. Comment: I want to convert our basement into living area but need it to be dry. Comment: Just want priceing for about 1900 sq ft. Comment: Finished basement with bar , tv, and home gym in same room. Comment: Quote to include full bathroom install, electrical, drop ceiling with removable tiles to get at heating baffles, plumbing. Comment: We would like a quote to finish our basement. We would like a full basement quote with a 3 piece bathroom if possible. Comment: We have an unfinished basement and would like to get a free estimate on the cost. Comment: We are looking to see what it would cost to finish our basement. Comment: I had a pipe burst in my basement on 2/1. Everything that was wet/damaged has been removed and the basement was professionally dried out. At this time I need to get estimates for restoring the space. It's the Closest Thing to Magic You Will Ever See!